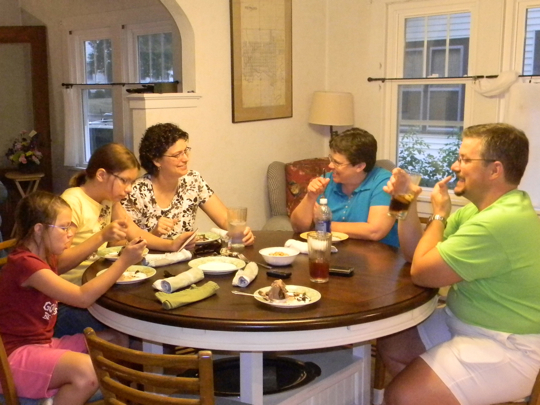 Kris came by (to our clean house) and it was great visiting with her and the Gebhardts. Kris is rather legendary for her many pranks while at Concordia, and Deborah had been involved in several. Now that Charles is in charge at Concordia and its 2,000 security cameras on campus, we had a moment of silence for the unborn harmless pranks that will never see the light of the moon. As planned, we ate ice cream cake and had no tissues. Kris was not weepy, and full of good stories. Later in the evening Lloyd rocked a kitten to sleep. That’s right, he was standing with a kitten in his arms and rocked it to sleep. He denied that he had ever done so before, but we knew it was just to save face with Kris. Unrelated, but funny nonetheless, I brought the anniversary flowers home from work, and it went just as I suspected it would. Ha! That last picture is funny. Say hi to Kris for me! GREAT pictures all around! Love Lloyd & the kitten! 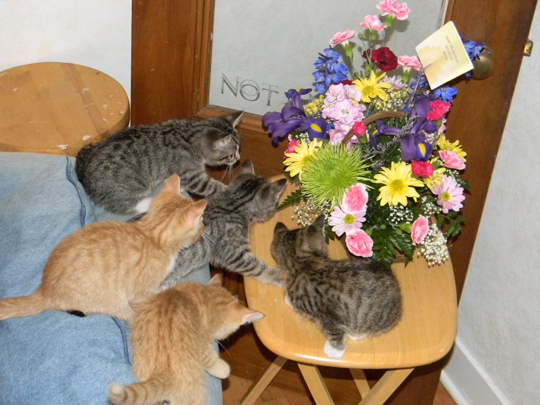 And the kittens & the flowers too cute! You need to send that in somewhere to win a prize. And I think I would have gotten along wonderfully with your prankster friends! Muahhhh!